I have the following clubs for sale (where I would be glad to accept a trade has been mentioned in the individual descriptions). Plenty of pictures available for each club, just request please. Shipping is a flat $50 anywhere in the world for one or as many clubs together. Will be sent by international courier priority and should reach in 3-5 days at most. Priced to sell. All prices PP gifted. 4. FW - Grandista 21.5* - Pending for now. 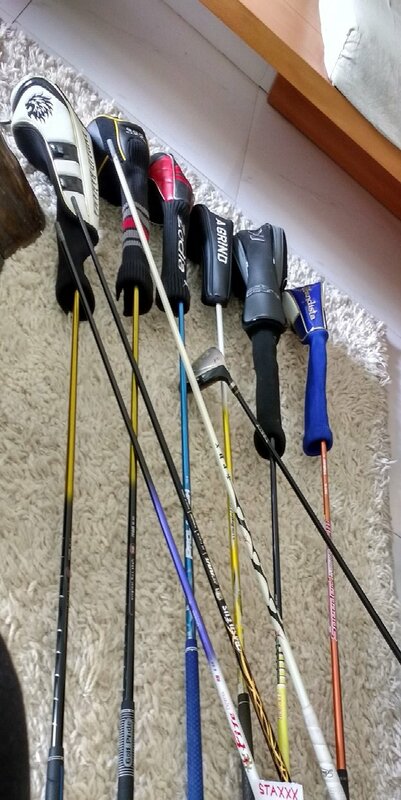 Rather than inundate this post with individual pictures, I am putting a group photo here and will happily send photographs of individual clubs and shafts to anyone who requests. Please PM and have fun. Priced to sell so prefer not to bargain too much. Thanks. All prices PP gifted. its a steal!!! if i dint have one id be all over this. AAA 2015 is the best off the rack shaft of all time IMO. I always wanted to try it. Now I have a Diamana X 60, the AAA and a Sanki. No 7D but a pretty good stable of "second bests (beasts)". Hope to be able to take a swing some time this year.. Awesome bro! You need to send me that diamana x 60 once your tired of it. The AAA is now sold! Thanks for the inquiries on the other clubs guys. Have priced these clubs well to sell, I hope. Also Buchi TP-03 putter or Benock mallet. Missed out on Chris' Honma TW-PT mallet. Hit me with your trades anyway. I've really cut these prices to give away levels !! Anyone interested should give it a try. Please don't ask me to cover shipping at these prices. Thanks! ..... have some fun! Raytis Touale sold - thank you TSG. Where do u reside Staxxx? Hi Pete. I am back in India now. Lived mostly in the US, UK and Belgium. Fire Express shaft sold. Thank you Sweden and TSG once again. Which Agrind 7 wood is it Staxx? Hi Ian. I don't know lol. It just says 7/ 21* Kobe Japan A-grind on the sole. It looks like a normal fairway wood. I will send you a pic. The Cobra Ltd. has sold. I have also updated the condition of the Zodia as there are some sky marks from use. Very minute and some touched up and not at all visible at address. Photos available.....and hence dead cheap. You can count on the Swedes 😄 We have another 2 months of golf to look forwards to before winter starts to creep up on us so we're stacking up on the good stuff. Egg Seven now $100 !! The Ryoma has now sold. Thank you. The Grandista club (21.5*) with the EVO II shaft, the A-Grind 7-wood (21*) with the Regio Formula MB shaft and the Zodia head (18*), and the Emillied Bahama head (10*) are left only.